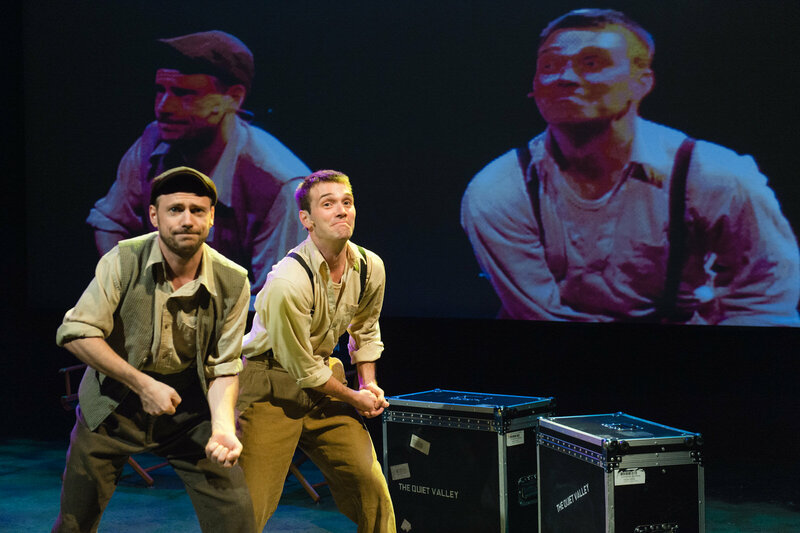 Engaging with warm-hearted humor and disarming in the depth of scenes about lost boys and bitter men with their dreams crushed, the Keegan Theatre production of the Marie Jones’ Stones in his Pockets (1999) is a winner of a serious comedy. Under the affectionate, perceptive direction of Abigail Isaac Fine, Stones in his Pockets aims for and succeeds at understanding; it’s not just “shtick” with over-the-top, camp characterizations. With adept acting prowess, Matthew J. Keenan and Josh Sticklin take on over a dozen idiosyncratic, quickly appearing, then smoothly disappearing, characters. Keenan and Sticklin give each of their characters their all – within the blink of an eye and without major costume changes, but through physical characterizations and voice inflections. The two actors can be Irish or American, man or woman, younger or old.